Ready made Dollhouses for the person short on time. To start out and begin to build your own miniature home is very creative and holds many inspiring moments in the process. However if you just do not feel confident in that area or lack time an already assembled doll's house is the answer for you. Or ones with little or no construction necessary. Or even hiring someone to create all that you want done. For this article, we have confined our topic to the already assembled houses and where you can find them. To start with there are many sites online that deal with the already assembled doll's house. Your search should win you some excellent results. Some sites not only list many mini mansions they even provide excellent shipping offers. Using any of the search terms above or your own variety should help in viewing great online offers. However keep it simple or you may overwhelm yourself with massive results and become discouraged with the process. We recommend sticking with a small number such as "10" examples. Top ten of your most desired choices. Make a pro and con list for each house you find intriguing and prune your list down until you have your ultimate choice. These next examples come from sites that have a lot to offer in the already assembled structure area. With the following sites you will find more than enough ideas to satisfy any desire you have. 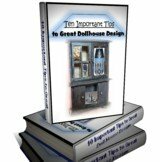 From the inexpensive to the more elaborate types of ready made dollhouses. If you live in the United States or in Canada you have a wealth of offers available. These sites attempt to take all the complications out of constructing your mini mansion for you. Let's face it these days fewer and fewer of us have the time to create for ourselves. That is a sad part of life but only too true. We all at times do have grand ideas but simply lack the time necessary to see them fulfilled. We all know the great values that Amazon has these days. So we could not leave them out. A convenient search box is provided for you. Test all results however as you could, as should be expected, if researched right, find a better price listed elsewhere. Here's a brief review of the Melissa and Doug Deluxe Wooden Folding Castle. The castle itself is sturdy and surprisingly detailed in its construction. Its so beautiful and my 4.5 year-old preschooler absolutely adores it... I did purchase a dragon, a knight, a fairy on a horse, and a catapult as some fun accessories. On the whole, this is a well-made product which I intend to keep for years to come. Search this link for already assembled houses too. For the Person who Desires to Create their own.